Info Kevin Cramer has a distinguished career in public service, including eight years in Governor Ed Schafer’s cabinet. Prior to his government service, Cramer served as Chairman of the North Dakota Republican Party. At age 30, he was State Chairman of the NDGOP and the youngest member of the RNC. Cramer was State Tourism Director from 1993-1997, during which time ND tourism first became a $1 billion industry. Cramer was appointed State Economic Development Director in 1997 and led that office through 2000. From there he went on to serve as the first director of the Harold Schafer Leadership Foundation, which connects emerging leaders from the University of Mary in Bismarck, North Dakota, with community business leaders. In 2003, Governor Hoeven appointed Cramer to the ND Public Service Commission. Cramer ran for the position in November, 2004, winning with 65% of the vote. He was re-elected in 2010, garnering over 61% of the vote in a three-person contest. 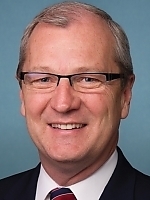 In addition to political work, Kevin Cramer is an adjunct instructor of business and management at the University of Mary and a university trustee. A popular master of ceremonies, Cramer carries his message of the call to be "servant leaders" to campuses and conferences across the United States. He serves on many boards and commissions and also chairs the Roughrider Honor Flight Committee, which raises funds and organizes flights for WWII Veterans to visit the memorial built in their honor on the U.S. Capitol Mall in Washington, DC.